It was a day I was dreading, for more than one reason. 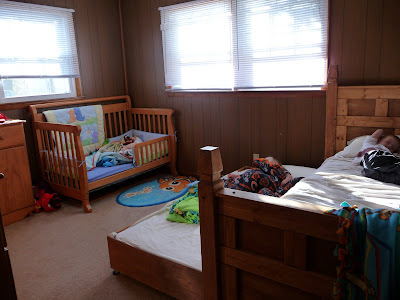 Significance reasons....."we're all done with the crib...."
Practical reasons......"now Ethan can climb out of his bed when he wakes up at 6:45 a.m. and I actually will have to get up with him at that hour....."
But, today, we decided, was the day. 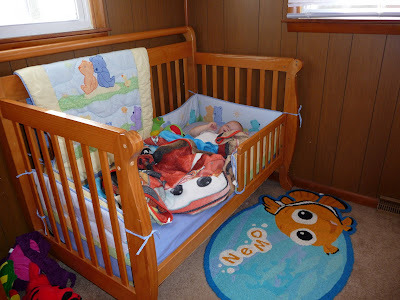 Time to turn Ethan's crib into a toddler bed. 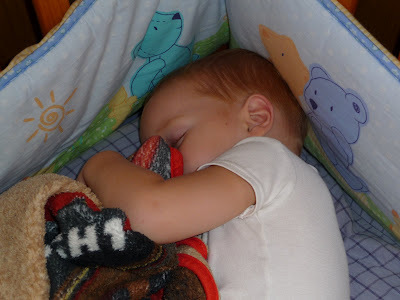 I was dreading nap time from about 9:30 a.m. on. If I believed in omens, I would hope that this was a good omen. 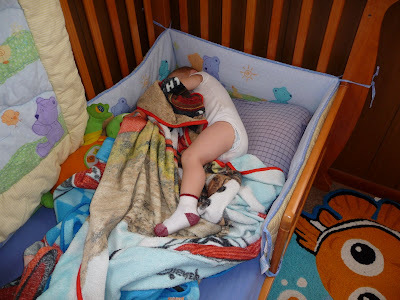 We walked in to his bedroom; I asked him if he was ready to take his rest in his big-boy bed; he nodded *grin*; I laid him down, and told him that he was to stay put in his bed, and not get up. He laughed and giggled quite a bit--I imagine thinking that this was the coolest thing ever. ....I had two sleeping boys and one semi-resting boy. Most importantly: Ethan was sleeping, and he had barely moved two inches, let alone gotten up. You'll have to let me in on your secret for getting them to all sleep in the same room nicely. W had to do some rearranging with rooms because Taylor and Quinten were having a hard time getting to sleep. Now Taylor and Spencer share and everything is good. We'll see what happens when we take the crib away. Hope tonight went swimmingly. too cute! i am glad he cooperated! i pray he continues for you! the only bad thing is the getting up at the crack of dawn! carter is up at 6 or 6:30 every day...yuck! 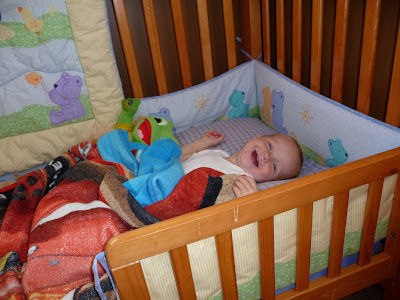 Yeah for sleeping in "big kid" beds!! I am so glad it went well for you! I have been thinking about changing Brody over too, but I haven't yet since he isn't getting out of it on his own. Both girls were out by the time they were 18months (I had to, there was another one on the way in a month or two!). Keep us updated, maybe I will change him over once I see yours is going well! Oops! That last one was me, sorry!